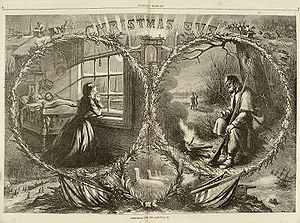 Christmas Eve 1862. Nast shows the wife and husband thinking of each other on Christmas Eve. The illustrations in the top corners show Santa visiting homes and military camps. This article is about the Christmas gift-giver. For the saint, see Saint Nicholas. Santa Claus, or simply "Santa", is an American popular cultural icon, likely brought over from German-speaking countries, the Low Countries, and Scandinavia. He has been a regular staple of the American observance of Christmas for about two centuries or more, and as well as much of the world. Santa Claus brings presents to good children every Christmas, rides a flying sleigh pulled by reindeer and lives at the North Pole. The ultimate basis of Santa Claus is Saint Nicholas, the Roman Catholic Bishop of Myra. In the ninth century AD, coincident with the Muslim invasion and re-invention of Roman Asia Minor as the Ottoman Empire, the bones of Saint Nicholas were transported to Europe. The many legends about this bishop—including a persistent legend about the "manna" coming from his body after his death—fostered the growth of new legends of Saint Nicholas being somehow larger than life. A village located at the North Pole, containing a toy factory and other facilities for the production and distribution of toys via a sled driven by flying reindeer. An uncanny ability to know whether any child has been "good" or "bad," typically in the form of a list of all children, appropriately categorized. Rewards for the good, and punishment for the bad. Traditionally, the good children receive toys and the bad lumps of coal. A requirement for belief: Santa is said to deliver only to those who believe in him. Non-believers get nothing. Secret comings and goings to make deliveries, via the chimney. In homes without fireplaces, some flexibility is required. Placement of small candies and similar "party favors" in children's stockings. Children are encouraged to leave a gift in return on Christmas Eve - tradition dictates a mince pie, a glass of sherry, and one or more carrots for the reindeer. Accomplishment of all this order fulfillment and delivery on one night of the year: the night of December 24–25. The date may vary in different cultures. Rovaniemi - A city on the Arctic Circle claiming to be the hometown of Santa Claus where the Santa Park is located. This page was last modified on 21 December 2018, at 20:33. This page has been accessed 16,975 times.